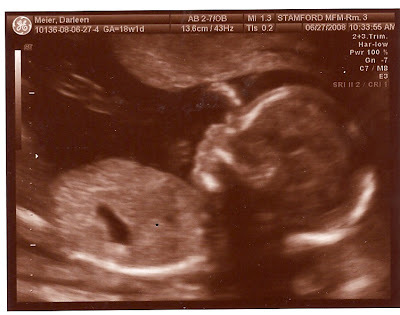 We had the big developmental ultrasound last week and so far everything looks good, which is always wonderful news. And the little bugger is….a boy….or a girl. That’s right. We are keeping this one a surprise, which is SO not like me. I am a planner and like to be prepared. And I really don’t like the antsy feeling of the unknown. But since we already have a boy and a girl and my deliveries are planned C-sections (which loses a little of the anticipation), I thought why not make this a happy surprise. Definitely not enough happy surprises in my life. The one thing I’m concerned about is the picking out of names. I know there will be a long list for both sexes. So here’s the little cutie. The post Ultrasound appeared first on Darling Darleen | A Lifestyle Design Blog .